In a region with the most freshwater access in the world, managing access to beaches where roads meet the water isn’t always clear. –	Protect public access and face decades-long costly lawsuits with waterfront property owners. –	Do nothing and watch tensions rise over use of the water, beaches and docks. –	Give up the waterfront property to adjacent owners and prepare for public disapproval. 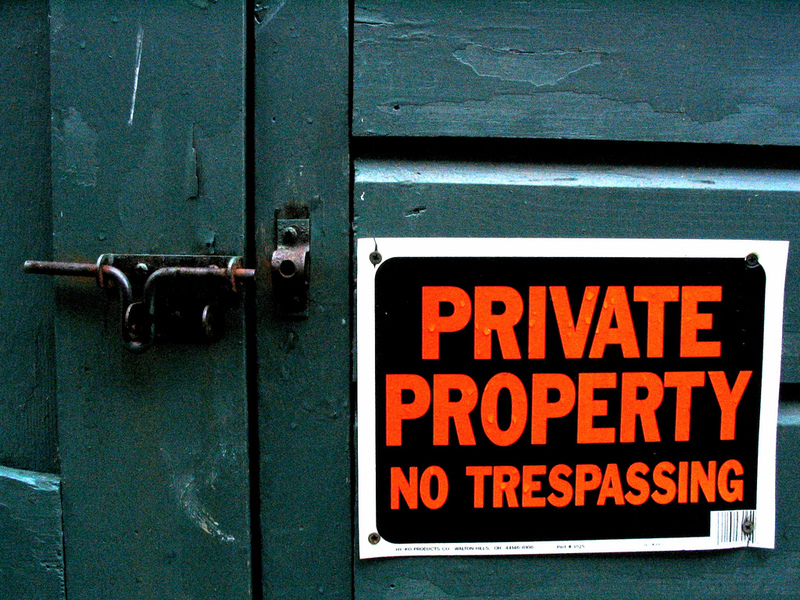 The latter happens when road-end sites fall out of use or when waterfront property owners, concerned about privacy or safety, request or sue for ownership rights. Some townships find it easier and cheaper to give the beach to adjacent property owners. In most Great Lakes states, the process involves the local municipality, the state’s department of natural resources and a public hearing. 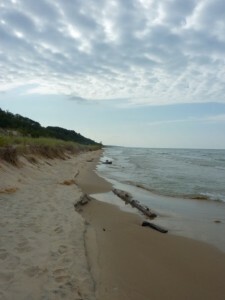 Lately, Wisconsin legal experts worry about townships indiscriminately giving up access sites and about loopholes that make it easier for public beaches at the end of roads to end up in private hands. It’s not easy to give up waterfront property at road ends in Michigan, said William Carey, a Michigan attorney who typically represents waterfront property owners seeking ownership of public access sites. A view of Lake Michigan taken during MSU's wilderness writing class fall 2009. Wisconsin municipalities have to hold a public hearing and obtain approval from the department of natural resources to give up access. 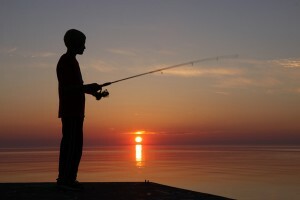 Private property owners usually don’t want boaters or people on inland lakes, said Dale Simon, chief biologist of Wisconsin’s Department of Natural Resources Waterway Protection Section. “They pay good taxes a lot of times and they get upset with people who don’t necessarily obey the law,” Simon said. Wisconsin usually receives one or fewer requests every year for abandonment, Simon said. Decisions are made on a case-by-case basis. How easily the public can access the lake elsewhere is usually taken into account. “Is this the only existing public access on this water body? If that’s the case, we’re not about to go along with abandoning a pubic access site on a public water body,” Simon said. But if there are a significant number of public access sites, and those sites have the capacity for boat-launching and better parking, then Simon sees why the state would abandon a public access site. Even then, “It’s clearly not to keep people out of public waters,” Simon said. So the state may not easily abandon access, but there are loopholes and inconsistent application of the law regarding lakeside road ends, according to a 2010 Wisconsin Law Review article. Right now, the way a public access site was established determines how it can be abandoned in Wisconsin. In one case a family owned both shorelines of a creek next to a highway that fishermen used to access the stream. The highway was removed and because of a reversion law, the land reverted to the family, according to the article. A Wisconsin court gave the family the roadway on both sides of the stream, essentially preventing public access. A fisherman sued and the state intervened, arguing that the abandonment required state approval. The state won. “While this case is a victory for the State and the public interest, the fact remains that public-access law is still inconsistently applied, which puts public-access sites at risk,” according to the article. A clear framework of statutes – all requiring state approval for abandonment – would fill any loopholes in the legal process, said Sarah Williams, author of the article. And the state should establish a clear legal procedure for townships, which sometimes fail to follow proper procedures, to make the process easier. Simon wouldn’t be surprised if townships indiscriminately gave public access sites to adjacent landowners. One of the main reasons municipalities abandon sites is because they have maintenance problems or they’re looking to save money, he said. I have a question that I hope someone can give me insight on. My in-laws bought lake property about ten years ago. The county bought the property from private owners for road ends but didn’t ever use them and then decided to put the property up for public auction. they bought it from the county on a public bid and the adjacent owners at the time did not want the property. I bought the property from my in-laws two years ago and now the property owners on both sides of me are taking me to court because they feel they should have ownership of the property instead of me. My in-laws bought it and it was deemed back to residential and they paid residential property taxes for ten years and I have been paying taxes on the property for the last two years I bought it in 2015. the neighbors on the East side of my purchased their property in 2014 and the neighbors to the West in 2015 also. They both feel that they have rights to our property so my question is, does anyone have a information on judgments of this nature I have already spent $7,200 in legal fees in court to fight this. Funny how the ‘public’ can claim to not be able to afford waterfront property while towing a $50,000 boat with a $30,000 truck to an access site. Or off lake property owners who want to install docks and boat lifts to party endlessly, using the waterfront access as their personal rest room because it is too far to walk back to their home four blocks from the water. But their taxes are a mere fraction of riparians. Abandoning the road ends are the best decision I know of. It always boils down to “abusers”. Not restricting their access to the easement or road end location(s). Why impose this burdon on the privacy of the waterfront owners? Would you want that in your front-yard? Would you want easement people strolling by, chatting loudly, all hours of the night, past your windows? Even wsalking on YOUR property? The township don’t want to…the county don’t want too…. Who’s responsibility is this gonna’ fall on????? Congratulations to William Carey! It’s not often that an attorney will admit that he actively works against the public interest. Imagine that, wealthy landowners flexing their financial muscle to intimidate government officials into giving up the rights of the multitudes. Sounds about right, unfortunately. What is the campaign budget for a township supervisor or trustee? It wouldn’t take much to influence some of these officials. On the other hand, some of these landowners can bring substantial resources to bear on a small township and the effect is indeed intimidating. Michigan’s legislature and those of other states need to step up and strengthen the laws that protect the public’s rights to access to these key resources. Citizens of the state pay taxes, too. As do the millions of visitors to this state through sales taxes, gas taxes and in many cases non-homestead taxes on vacation properties.